As women with career aspirations we're in the box seat. Not only is there a day for us - International Women's Day (#BeBoldForChange - happy #IWD2017 everyone!) but it would appear (according to the 2016 Future of Jobs Report) we have the traits and characteristics that will be highly sought after in 2020. We're one year on from the Future of Jobs Report: World Economic Forum that did the rounds at Davos in 2016. There was a handy table that itemised and contrasted the critical skills that a range of experts ranked as highly desirable for each of 2015 and 2020. 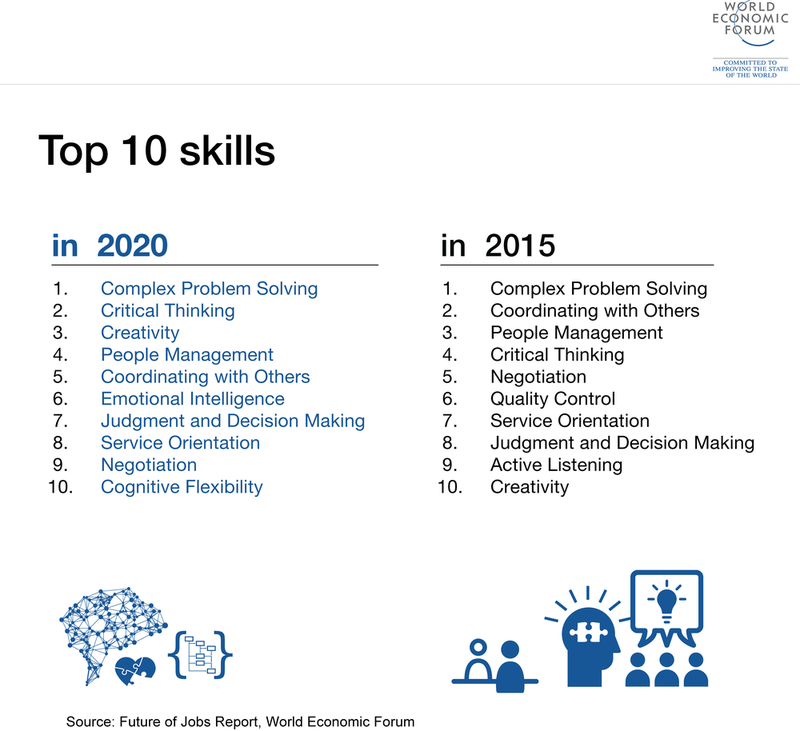 Notice how even in 2015 the top five skills tend to be more complex, nuanced and require relatively sophisticated human brain power. The 2020 top five are even more so with creativity making it into the top five, and emotional intelligence and service orientation moving up the list. Once again, these are nuanced, relatively complicated and subjective type skills and traits. If the future of leadership follows the future of jobs, then it's a no brainer really that you should be talking up and highlighting the complex problems you solve, the critical decisions you make and your abilities to create collaborative pathways. Yet when I read CVs many of us are still making rookie errors - relying on outdated CV templates, stereotyped notions of leadership from the movies and a language legacy from high school. So to help you develop a brand that's known for the benefits of your higher level expertise, and to land roles where you get to make a bigger difference (i.e. leadership) here are three big things to avoid. I have it on good authority that if your CV actually gets read, you get about a 4 second scan. If the reader is interested then that extends by another 10 seconds approximately. If the reader is then interested you are sorted into the pile for a more thorough read. So you definitely need to make sure that you have the important things up front in an easy to read and interpret format, on the first page. Yes, you could list your education and experience upfront, but you might be better off demonstrating and providing evidence of how you apply both your education and experience in solving real world complex problems, and what results you deliver as a result. My suggestion? BLUF it up. Get your Bottom Line Up Front (BLUF) on the front page including real world, tangible practical applications, achievements and results of your expertise on the front page. Make it easy to help you and hard to ignore. Does this come from a fear that if you don't write it on your CV then people might imagine you haven't actually done it? Once again, if you focus on your results, highlights and achievements then it will be assumed that you have the higher level expertise required to deliver big picture results, and that you can either do or delegate those lower level tasks that were part and parcel of delivering the bigger overall project. Old/early roles are the worst. It's as though we have a blind spot on old roles. - meaning we don't even see those lower level early career type responsibilities still listed. My suggestion? Roll it up. Make it easy for people to help this newer more leaderly version of yourself. And do a substantive audit of old roles that still list lower level responsibilities. Roll them up into a couple of achievements with a focus on the big picture and your future instead. I work with some seriously smart and talented women (and even a few men) who all have bright futures in front of them. In some of the CVs of women in particular there are some troubling choices of language that we use to describe ourselves. Words like efficient, hardworking, conscientious and loyal to name a few. Many of you will know Avril Henry. She is a pretty inspirational speaker who has been focused on, and speaking about, gender equity for many years. One of the most confronting talks she gives is her language talk. She invites members of the audience (men and women) to describe themselves or their brand in four or five words. While the men tend to use language like results oriented, driven, strong, dynamic or authoritative, the women more likely use words such as efficient, hard working, loyal and conscientious. Why is this a problem? If businesses need leaders who can solve complex problems, are critical thinkers, adaptive, consultative, creative and able to make sound judgments in the face of ambiguity or adversity then why are we still describing ourselves as workers from the 80's? We are seriously underselling ourselves and the advantages that our leadership style brings, in a big way. My advice? Big it up! Audit your CV immediately and remove references to hard work, loyalty, conscientiousness and efficiency and instead focus on real life examples of the work you did and the results of said work. Efficient is one thing, but effective is far better! Borrow from some of those masculine qualitative labels such as strong, driven, results oriented and remember also to include qualities from the 2020 Future of Work report. Be bold. When you downplay it's not just you who misses out. It's the others in your remit and beyond as well. We need to be prepared to step up and play our big (sometimes tough) game despite old notions and old ways. Because when we play small, change is really slow. When we play big we are far more likely to make a far bigger difference. We've been working hard on gender equality for years. it's time we worked far smarter! Let's be bold together. Your thoughts? Would love to hear from you. Get in touch and let me know how you might embrace bold this year. Newer PostIt's not all about the money. Or is it?